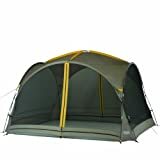 Keep family and friends protected from the elements with this 100 square feet camping tent. The screen house has plenty of floor space to fit a family of 4. It provides a safe haven from the sun, wind, and bugs. The camp house sports a T-door design both on the front and back for easy access. Loop closures keep the doors open and you get zippers that keep the doors perfectly closed. A carry bag is included for easy storage and transportation. This camping screen house sets up in less than a minute. 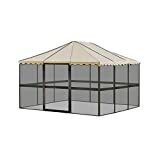 It’s a quality screen house with a price that’s hard to beat. This screen house makes hands-free entry a reality. It has a magnetic door on the front and back to provide the convenience of an automatic closure. The walls come in a mesh design to keep out insects, improve ventilation, and keep you protected from the elements. At 99 square feet, the tent has plenty of floor space to accommodate a picnic table with enough room to spare. Straight walls create more headroom to fit tall persons. 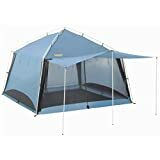 This is a screen house that gives you the space you need when out there camping. A family of 6 can fit in this screen house without a hitch. This camping house has 140 square feet of floor space and stands 86 inches tall to provide enough vertical clearance. A doom-shaped roof keeps you sheltered from the sun and allows rain water to drain off with ease. 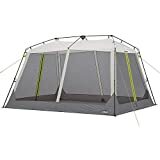 The tent has two inverted “T” doors for easy entry and exit. This is a shelter that’s perfectly ready for your next adventure. 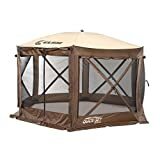 This camping screen house has you covered, whether day or night. Sporting a vaulted ceiling, the tent ensures that taller guests get the vertical clearance they need. The hexagonal floor provides 90 square feet of space, which is more than ideal for a family of 4. This screen house is UV-treated to keep it from being degraded by harmful rays. There’s a door on the front and back with a zippered closure to keep it shut. It’s a fantastic sanctuary against insects and the elements. With awning and built-in rain curtains, this screen house takes comfort and protection a notch higher. It’s a large house standing 101 inches tall to provide plenty of vertical clearance. At 144 square feet, this screen house comes large enough to comfortably fit a family of 6. There are two full-length doors that open completely to let you through even when carrying lots of gear. The frame is fabricated from aluminum to provide a lightweight, portable construction. Get a 360 degree panoramic view with an all-mesh construction used on the walls of this screen house. 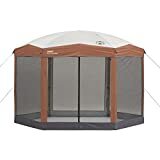 It sports a durable canopy made of 150D polyester fabric to provide a high level of UV protection. The screen house has 120 feet of floor space great for a family of up to 6. It’s 84 inches tall and has overheard storage pockets to keep your small essentials. This is a great screen house that sets up in a matter of seconds. This no-see-um mesh house comes in a sturdy construction that’s built to last. It’s fabricated from 210D and 600D polyester fabric providing water resistant qualities and 50+ UV protection. Built-in flaps keep out rain to ensure that the floor remains dry. This screen house has 94 square feet of floor space enough to fit up to 6 persons. It’s a shelter that will perfectly fit your camping lifestyle. Smartshade screen house makes outdoor fun even greater. This camping screen house comes at a fairer price that looks too good to be true. It’s removable screen panels deflect insects without a hitch while shielding you from the elements. The height is adjustable shifting the canopy from a near flat design to a pyramid shape. There are two doors with 100 square feet of floor space to fit up to 6 persons. 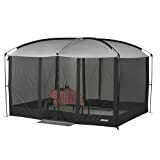 This screen house gives even the tiniest insects a hard time getting inside the tent, thanks to a tighter-woven no-see-um mesh screen. The tent provides 50+ UV protection and sports taped seams to keep it watertight. The panels are adjustable and you get up to 110 square feet of floor area ideal for a family of 4. The screen house doesn’t give you a hard time putting it together since it sets up in just 45 seconds. This stand-alone living space comes tougher. Instead of fabric mesh, it uses fiberglass panels that keep every single insect out while letting in the fresh air you need. The roof sports a 3-layer vinyl construction resistant to mildew. The frame has a protective finish that resists any form of fading and oxidation. This screen house has 134 square feet of floor space enough to fit up to 8 people. Want a durable screen house with a luxurious look? Well, look no further than this camping screen house. Set up your camping ground in style with these screen houses. Trust them to keep you protected from insects and whatever the weather has in store for you. 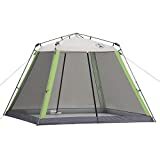 Now that you have some clue on what to look for, don’t hesitate to visit Amazon and add one of these screen houses to your camping gear.